The CRI is applying our expertise in harmonizing, managing, and building tools to work with clinical data to an exciting new National Institutes of Health (NIH)-funded study. In 2016, the NIH launched a nationwide seven-year initiative called Environmental Influences on Child Health Outcomes (ECHO), which investigates how the health of children and adolescents is determined by environmental influences during their early development. The University of Chicago is home to two ECHO studies, for which the NIH has awarded approximately $5 million during the first two years. The CRI is playing a key role on the research team of one of these ECHO studies, led by Principal Investigator Erika Claud, MD, Associate Professor of Pediatrics. ECHO research focuses on four areas of pediatric health care that are of particularly high public health impact: obesity; pre- and post-natal outcomes such as birth defects; airway conditions like allergies and asthma; and neurodevelopment. ECHO studies address a wide range of environmental influences that can affect outcomes in these areas, from physical and chemical surroundings to social and behavioral factors. The program is designed to capitalize on existing cohorts, extending and expanding current studies and enabling research to evolve and take advantage of new clinical data networks and technological advances. Dr. Claud’s study is titled “The microbiome as a potential mediator of socio-economic disparities in preterm infant neurodevelopment trajectories from the neonatal intensive care unit discharge to school age.” It brings together a multidisciplinary team of University of Chicago researchers including co-investigators Professor James Heckman, Dr. Jack Gilbert, Dr. Bree Andrews, and Dr. Michael Msall to look at how environmental factors, particularly those factors that are correlated with socioeconomic status (SES), affect the makeup of premature babies’ microbiomes during key periods of development. By looking at data for these children through the early years of their lives, the study will also address the question of how such variations in microbiome affect these vulnerable patients’ neurodevelopment and ultimately their school readiness. 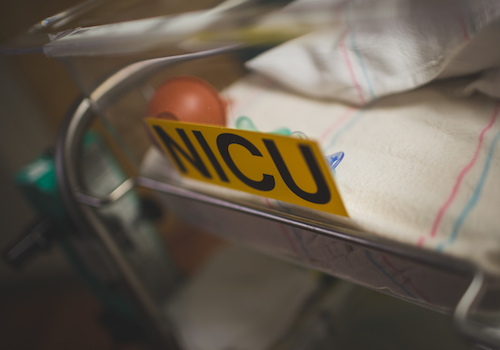 Eventually, this research could lead to innovative interventions for premature infants, potentially reducing the gap in neurodevelopmental outcomes between low- and high-SES babies. In ECHO studies, the first two years of the seven-year study period are expected to be primarily spent harmonizing and analyzing data from the existing cohorts. Studies that meet certain milestones will then gather additional data during the following five years. The patient group for Dr. Claud’s study includes existing cohorts of preterm infants from NorthShore University Health Systems Evanston Hospital, Beth Israel Deaconess Medical Center, the University of California San Diego, and the University of South Florida, as well as the University of Chicago Comer Children’s Hospital. To turn the large quantity of patient information gathered from these five cohorts into datasets usable for research requires an experienced team and a robust, secure infrastructure. As the Data Coordinating Center (DCC) for the study, the CRI is the leader on this project for all aspects of data collection and management. The study leverages our abilities across several areas. Our existing streamlined processes for HIPAA-compliant data intake and housing, our experience with developing systems for tracking biological specimens, our expertise in data interoperability and harmonization, and our familiarity with the legal and regulatory components of working with patient data all make this study feasible. Our ongoing successes with similar work for other large-scale, multi-site clinical studies, such as the GAIN Consortium and the March of Dimes Prematurity Research Center, have prepared us to take this lead role on the ECHO study. As the DCC, the CRI team is responsible for the oversight, management, tracking, analysis, and integration of all data collected for this study. To allow clinical information to be gathered and reported in real time, our developers are building a data intake system in REDCap that can be securely accessed by data coordinators at each of the five study sites. To handle the biological samples that are required for a study of the microbiome, a tracking system similar to the one we built for the March of Dimes Prematurity Research Center will facilitate the association of these samples with study participants while preserving patient anonymity. The development of these systems is being led by CRI Director of Applications Development Brian Furner, who has built comparable systems for several other projects. Brian has extensive experience with data modeling and sharing data between research institutions, which he has applied in projects including GAIN, March of Dimes, SHRINE, CAPriCORN, and the Gabriella Miller Kids First Data Resource Center. Both information about the samples and all the phenotypic information collected from each site will be stored securely on CRI infrastructure, where it will be integrated with genomic information generated by the UChicago Genomic Sequencing Core Facility. Our High Performance Computing cluster, which is integrated with this our storage and virtual server systems, will be used to perform analytics without the need for data transfer. In addition to collecting, storing, and tracking data, the CRI is also contributing important data analysis for this study. In order to model the impact of the microbiome on neurocognitive development, study participants are followed longitudinally from birth, through their stay within a neonatal intensive care unit (NICU), and then to two later neurocognitive assessments at two years and school age. Senior Statistician Anoop Mayampurath, PhD, who is an expert in the statistical modeling of patient electronic health record data and leads the CRI’s clinical data science efforts, will perform analysis of all clinical data captured for this study during participants’ NICU stays. The analysis of microbiome health in tandem with patient health is crucial for determining the short-term impact between changes to the microbiome and a participant’s risk of deterioration during their NICU stay. Beyond technical resources and skills, projects that rely on patient data cannot succeed without expertise in the legal and regulatory components of protecting patient privacy. The CRI’s Julie Johnson, RN, MPH, has extensive experience working with research administration and legal counsel to enable cross-institutional clinical research. She developed the Internal Review Board (IRB) protocol for this study and shepherded it through the approval process. The CRI handled negotiation of the legal instruments needed for the study, including a data contributor agreement and a data use agreement. Our security policies and procedures, which are approved by the UChicago Data Governance, Stewardship, and Oversight Committee, set the standard for policies and procedures that will be in place at all participating institutions. The CRI’s expertise and proven successes in these areas are a key component of the University of Chicago’s ability to take a leadership role in multi-institutional studies like ECHO. Though some research on full term infants exists, no significant microbiome research has yet been done that takes into account the NICU environment and unique medical challenges of premature infants. This longitudinal study will fill significant gaps in medical knowledge about how the microbiome affects the neurodevelopment of preterm infants and potentially lead to meaningful interventions and improvements for both individual children and public health.